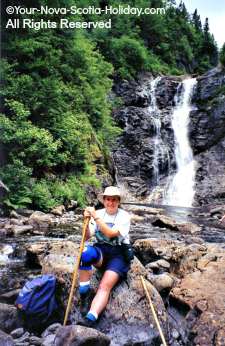 The North River Falls Trail is a challenge! You will love every minute! 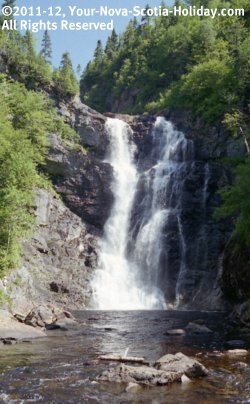 The highest waterfalls, 32-m(105-ft), in Nova Scotia await you at the end of this magnificent trail. Take your swimming suit, you might need a cool dip when you arrive. The name of this trail comes from, of course, North River. 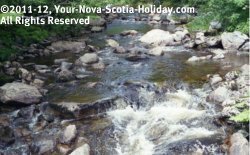 This river winds its way down from the Cape Breton Highlands and into St. Ann’s Harbour. There are actually three branches of North River: west, east and middle. The trail will follow the East Branch to take us to the falls. Be sure that you are ready for this 7-hour hike. 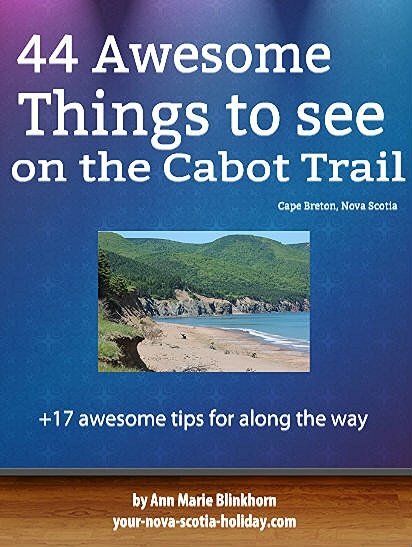 I must say that I was intimidated when I first read about this trail but now I count it among my favorites in Cape Breton. 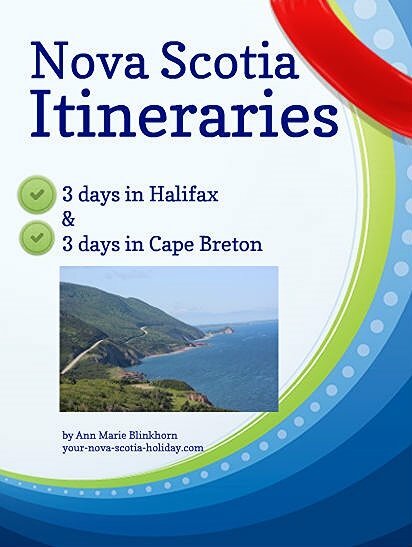 This trail is an adventure that everyone living in or visiting Cape Breton should experience. It will take you into the heart of the highlands and you will witness nature as you ever never seen it. The trail is part of the North River Provincial Park and Wilderness Area. The park and trail are very well maintained with picnic and outhouses at the trailhead. There are also guardrails, wooden footbridges and benches along the trail. A large map of the North River Falls trail route is displayed at the trailhead and smaller maps are along the route. Directions: Take Exit 11 off Highway 105 near St. Ann’s. You are now on the Cabot Trail; follow the directions to North River; and turn left on the Oregon Road. Drive about 3.5 km (2 mi) (keep to your left) to the provincial picnic park. Look for a large map of the trail, next to it is the starting point. If you are coming from Ingonish, stay on the Cabot Trail which turns right towards Tarbotvale just before the Englishtown Ferry. Follow the directions to North River; and turn right on the Oregon Road which leads to the park. Distance: 18 km (11 miles) return. Time: Approximately 7 hours if you hike the entire route suggested. You must return by the same trail so you can determine how long you wish to hike. Level of Difficulty: Easy to moderate to difficult. The trail during the first several kilometres is easy walking. It starts to get more difficult as you hike closer to the river. There are steep hills which can be very rocky and rough. Only those in generally good physical condition should hike this trail. Food/Water: Lots of water and a lunch will be necessary due to the time and distance of this hike. Clothes/Accessories: A sweater or light jacket as it may be cool at the foot of the falls; walking stick for those steep climbs; hiking boots; insect repellent; field guide for plants and flowers. A swim suit may be a good idea if the idea of taking a dip in the pool beneath the falls attracts you. The trail starts to the right of the large map located at the trailhead. This first part of the trail is fairly steep but don’t panic just yet as this is actually a connector trail. You will come upon the main trail a short distance away. Turn left at the top of the steep hill. You are now on the main trail. You will follow this old cart road for several kilometres before the trail narrows. 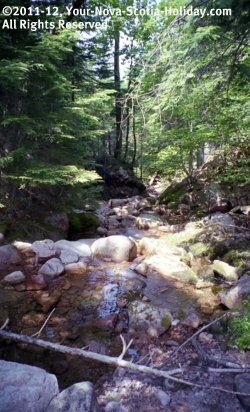 This old road is in very good condition and you will certainly enjoy this very pleasant and easy part of the trail. After hiking for about 45 minutes you will come across a fork in the road. A sign will indicate that the trail to the falls continues to the right. Straight ahead is a fishermen’s path to the river. This is a very nice side trail. It takes about 10 minutes to get to the river via this trail. This is a good place to use as a turnaround point if you do not wish to do the entire hike. Back on the main trail, you may notice stone fences and foundations after you make the right turn. This is because families once lived here. This entire area was settled by Highland Scots in the 1800’s. A school house for the children was located near the park entrance. You will find the benches along the trail very useful for snack and waters breaks. Hand rails have also been installed by park officials since certain sections of the trail are very steep. You will actually scimper and climb in some areas. There are several side trails as well. These are fishermen trails which lead down to the river bank to breathtaking salmon pools. We saw a fisherman fly fishing when we were there and I was mesmerized by his style and grace. It was a truly inspiring sight. If you don’t wish to hike all the way to the North River falls, any one of these spots can serve as a picnic area and turnaround point. But I know you want to go all the way to the falls! Right!! The trail will vary in altitude and, at times, you will hike high above the river. Other times, you walk beside it. Either way, you will always hear it. You will also be able to cross the river several times with the assistance of very sturdy wooden bridges. The last couple of kilometres of the trail are challenging but it will be worth every huff and buff. The inspiring North River falls (did I mention they are the highest in Nova Scotia?) are awaiting you. Take your time once you arrive at the falls and admire the beauty surrounding you. This is a soothing place and you should not be rushed. Enjoy your picnic lunch at the base of the falls. Once you have had a rest and you have fuelled yourself with some food look for a side trail nearby. A very steep path will lead you to a look-off. That is, if you have any energy left in your legs! You can return to the trailhead the same route you hiked in. Make sure you give yourself enough time to get back to your car before sundown. This really is a fantastic hike so I hope you can do it! I also hope that you will share your experience with us. That's right! 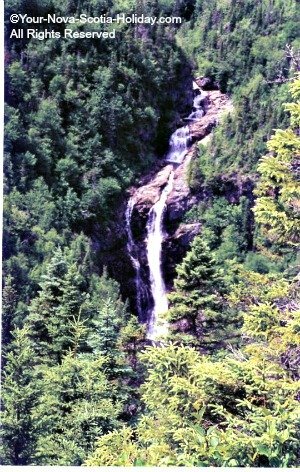 Write about your hike to North River Falls and send it to me for this website! Have you hiked the North River Falls?